Co-instructors Rami and Mika had already set up everything when I arrived at an ungodly 7:30 at Hyvinkää airfield. There was a strong wind gradient, which is quite usual in autumn and winter under high pressure conditions. Also the wind was a bit cross, but it luckily it was not too strong for our students. 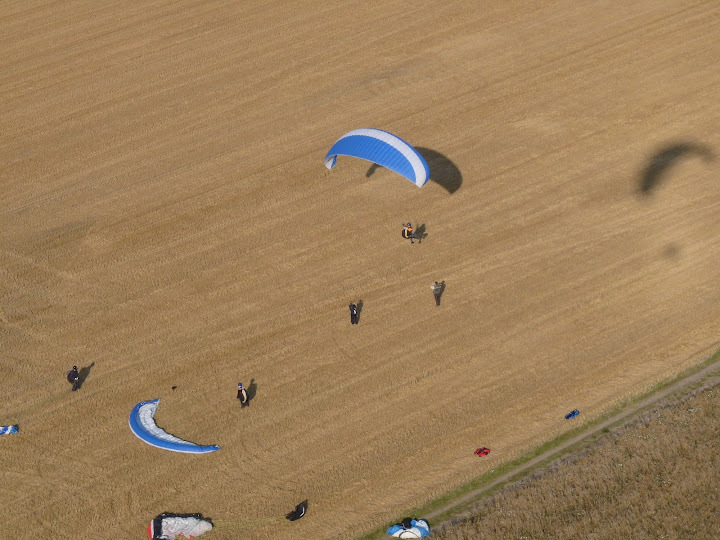 We towed the students as much as we could, and once it started to be a bit thermic took a couple of flights ourselves. The air started to be buoyant here and there and at the same time the airfield surface became a bit turbulent, of course. So at 11 we decided to break for lunch. Rami suggested we all move over to the nearby Kärkölä field, a dirt road between (harvested) wheat fields. I was a bit skeptic, expecting too much thermal turbulence, but if that would be the case we knew it would soon calm down this late in the season. It turned out that conditions were just perfect for teaching. Moderate too light, and straight, winds, and some nice weak thermals. It was often easy to talk the students into thermals and every now and then they had 10-15 minutes flights! I did a couple of flights myself, the best lasted over 30 minutes and took me all the way up to the very thick inversion at 700m. All in all it was a truly beautiful day; some of our students (and of course the instructors) had the stamina to go on into the twilight and made some 20 flights! Mika and Rami made a bunch of pictures; especially the landowner would like to have some air shots of his harvester.